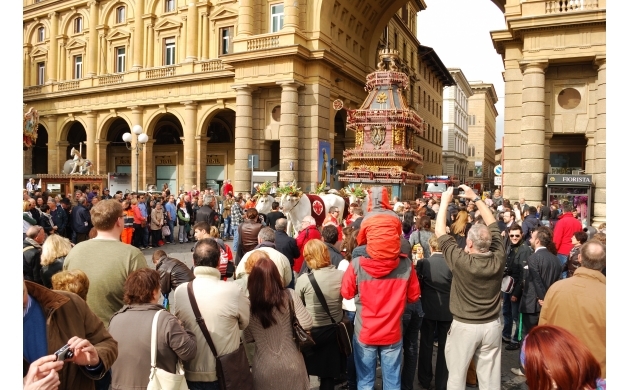 There is a strangely named event that takes place every Easter in Florence: the explosion of the cart ("lo scopppio del Carro"). The explosion of the cart is one of the oldest of the Florentine traditions. On Easter Sunday, a nine meter tall antique cart packed full of fireworks completes a procession through the city center, arriving at the Duomo where it is then blown up. The explosion of the cart is a ritual whose history is tied to the First Crusade. But how did this ritual from the crusades come to Florence? Around 2,500 Florentines participated in the First Crusade. They were led by the nobleman Pazzino de Pazzi ("The little madman of the madmen") the first of the Pazzi family. Pazzino was the first crusader who was able to scale the walls of Jerusalem, forcing the Muslims inside to flee. He then raised the Christian ensign on the wall and by these acts of bravery facilitated the Christian conquest of the city. As a reward for his courage, Pazzino was gifted with three flints from the Holy Sepulcher. Having liberated Jerusalem, the crusaders gathered on Holy Saturday at the Church of the Resurrection where they were each given a blessed flame as a symbol of purification, lit directly from the flints given to Pazzino. From this historical occurrence was born the Florentine custom to gather at the cathedral to light a giant torch, carried throughout the city in order to take the holy flame to each and every house. In fact, at the end of the Crusade, Pazzino de Pazzi returned to Florence, carrying with him the flints of the Holy Sepulcher, that were used to light the candle of Holy Saturday. This ceremony was transformed into a popular festival when the ritual of the enormous cart was added which, burning like a giant candle, was able to diffuse a great light - symbol of the resurrection of Christ - to all the people of the city. Today, the flints are kept in the Church of the Santi Apostoli, where anyone can view the relics and find a parish priest willing to tell the story. The cart, which the Florentines call the "Brindellone," is over 9 meters tall and sleeps for the entire year between two giant doors near Porta al Prato (on via il Prato #48). 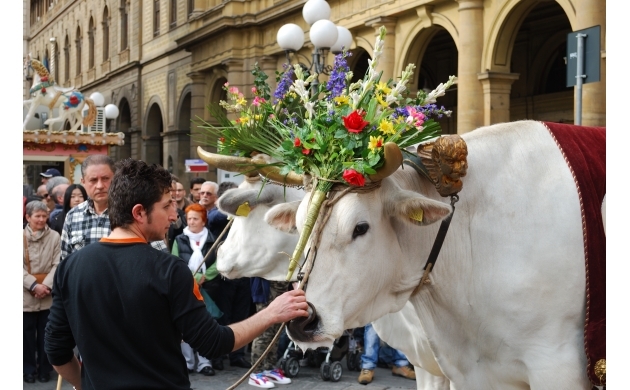 On Easter Sunday the doors open and white oxen carry the enormous structure with its wobbly gait all the way to the Duomo of Florence. The story of the name Brindellone is a very curious one. "Brindellone" is in fact a Florentine term for an awkwardly tall, graceless person - usually very badly dressed. But the meaning of the term itself comes from a different Florentine festival, the celebration on the 24th of June to mark the patron saint of Florence, John the Baptist. This Christian Saint is always depicted wearing a camel skin, a cloth which the Florentines call "brandello" or "brindello." For this festival a giant cart is also used, and because John the Baptist always wears an animal pelt (the "brindello") the cart came to be called the "brindellone" (the big brindello). 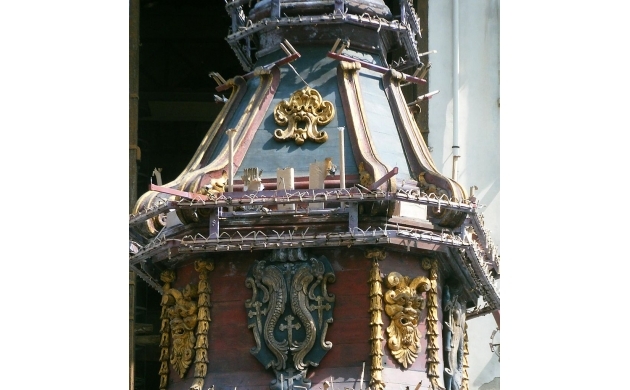 It is because of this that all Florentine carts, including the Easter one, are called "Brindellone." 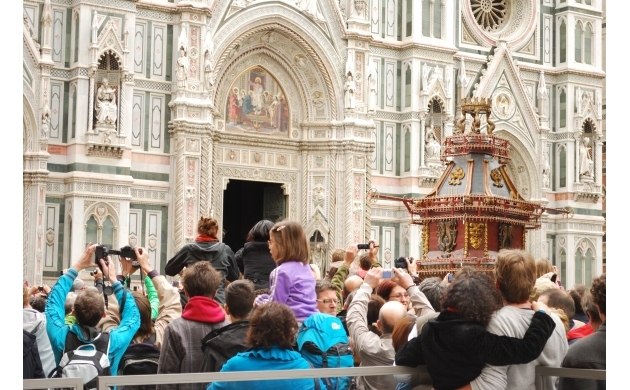 The journey of the cart is accompanied by the historic procession of the Florentine Republic, which leaves from the depot in Prato and arrives in the Piazza del Duomo. The procession includes musicians, soldiers, characters in period costume, and neighborhood folks who follow the cart all the way to the Piazza della Republica where they are then joined by flag bearers. After a demonstration by the flag bearers, the procession resumes its course until the Piazza del Duomo where the cart stops. The moment that the cart stops, its four sides - each adorned with representations of the four Florentine neighborhoods - are aligned in the direction facing their respective quarters. At this point there is held the draw for the tournament of the Florentine Calcio Storico - one of the most important events of the year - and one which no true Florentine can miss (however it is extremely difficult for tourists to buy tickets). In a red velvet bag are the little colored balls, each with a color corresponding to the traditional neighborhoods and the teams that represent them in battle each June on the "sabbione" - the sandpit - of Piazza Santa Croce. In front of the representatives of each neighborhood, the team captains, and the mayor of Florence - a small child reaches into the bag and extracts two little balls to determine the first two squads who will face off in the tournament, then he takes out the other two to compete the pairings. At the end of the mass, a rocket in the shape of a dove is launched from the high altar inside the Duomo which strikes the Brindellone, setting off a chain reaction that causes the fireworks to explode. Tradition dictates that the flaming dove completes a smooth and precise journey without any hitches: from the high altar to the cart and then backwards again to the high altar. If the journey goes successfully and without incident, a happy year and a good harvest is guaranteed for the city of Florence. However, if the dove stops before returning to the Duomo something terrible is bound to happen. For this reason, all Florentines await the tradition with bated breath, in the hope that the dove completes his flight without any glitches. The last time that there was an incident with the dove was in 1966, the exact year in which the terrible flood struck the city of Florence. If all goes well, the pyrotechnic spectacle finishes with the appearance of the three flags at the top of the cart and the explosion of three fateful booms that signify the end of the entire ritual.